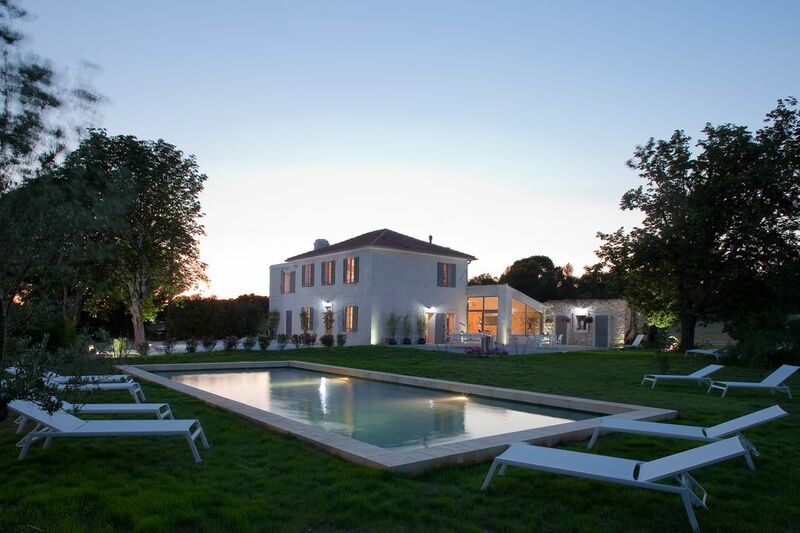 Accommodating up to 12 people, the “Bastide La Valentine” is a lovely luxury provençal stoned-built house of 250 m2 (2691 sq feet) situated in Aix-en-Provence in the very sought-after district of Puyricard. It is at 12 minutes by car (9 Km) from the historical center of Aix-en-Provence. The elegant Bastide combines the sophistication of the nineteenth century and the contemporary style in order to offer our guests a moment of real relaxation in the 1.4-hectare park (3,5 acres)… From our lavender field, you can admire the mountain of Sainte Victoire, so dear to the painter Paul Cézanne. Culinary enthusiasts and concerned with making your stay as comfortable as possible, your hosts are masters of entertaining: They organize a welcome dinner included in the rent prepared before you by Michael, renowned chef of Aix en Provence. He proposes a menu of refined and sophisticated dishes, made using local ingredients and Provencal flavors. Everything is beautifully presented and sure to excite all your senses. It’s a wonderful experience to share with family or friends. Applicable only for rentals of at least one week minimum. To maximize privacy, the bedrooms are spread out on different floors and areas of the house. You can follow us on Twitter and Facebook to see more pictures of the property and to know more about restaurants, activities and history of Provence. Only 12 minutes from the historic center of Aix en Provence, La Bastide La Valentine offers charm, elegance and serenity. The private residence sits on a wooded area of 1.4 hectares (3.5 acres). Equipped with 6 beautiful bedrooms, La Bastide can host up to 12 guests. With its contemporary ambiance, refined decor and luxury furnishings, it’s the ideal vacation rental for staying a week or weekend in Aix en Provence any time of the year. To relax in the evening of your arrival, we offer our guests a free Provencal meal prepared before you by the Chef. Having worked in prestigious kitchens, the chef is a perfectionist; he likes to give free rein to his creativity while being in love with local products. He invites you to discover his gastronomic cuisine that you will enjoy with emotion on the beautiful terrace (only valid for a minimum stay of one week). Nous sommes venus passer le jour de l'an dans cette très belle propriété. Corinne avait pris soin de décorer la Bastide. Tout était parfait pour notre groupe de 10 adultes et 2 enfants. Nous reviendrons avec plaisir. Nous avons pu nous rejoindre tous en famille, ce fut l'endroit idéal. Le temps était très doux, nous avons donc pu déjeuner dehors le jour de Noël. La maison est très confortable, très propre et très bien équipée. Court séjour, mais tellement agréable dans cette superbe maison suréquipée (machine à café extraordinaire) jardin magnifique, le rêve ! Nous étions 10 amis pour un enterrement de vie de garçon, tout est conçu pour que chacun ait son espace privé sans se marcher dessus. Les propriétaires sont d'une gentillesse remarquable. La bastide est un endroit paradisiaque ou l’on peut oublier le reste du monde ! Cette maison est chaleureuse, lumineuse elle permet à chacun d’avoir son espace, idéale pour se retrouver en famille. Un bon point pour la literie, c’est rare est tellement agréable ! Merci aux propriétaires qui sont des personnes très dévouées. I can warmly recommend this accommodation. In reality, everything is even more beautifl than on the photos. The accomodation is very well furnished and clean. Corinne and her husband are warm-hearted people who are very keen to give their guests a great holiday. And that’s exactly what we had. Thanks again. We would come back any time ! På landet 5min nord for Aix en Provence, omgivet af marker og tæt på skoven. Den lille by har alle bekvemmeligheder og dagligvarer samt en ugentlig Greenmarket. Du kan gøre snorkling og vand fritid i Middelhavet bare 40min væk. Ideelt sted for hvile og ro, tæt nok fra Aix en Provence, le Luberon, Avignon og Marseille-Provence europæisk kulturhovedstad i 2013.